The cougar, also known as a mountain lion or puma, lives in the wild on Vancouver Island in British Columbia, Canada and is the largest cat found in this Province. The cougar does not like being in contact with people and he was well aware of the fact that we were around the area before we knew he was there. This beautiful picture lets you see how cute the face of a cougar or mountain lion is but never let his looks fool you. 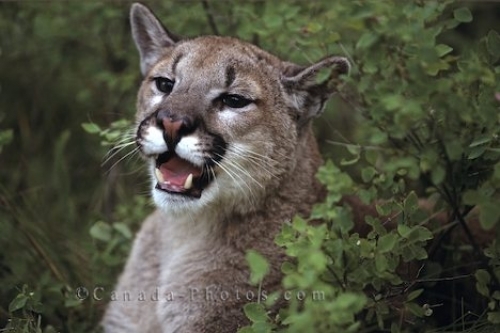 Photo of the cute face of a cougar or mountain lion in the wilderness on Vancouver Island in British Columbia, Canada.